Parking is available throughout many lots located at and around the Indianapolis Motor Speedway. Available on many different surfaces such as pavement, grass, gravel and dirt, there are plenty of locations to choose from that are near your seating location. Please note that all parking, including ADA parking requires a pre-paid pass. All vehicles entering the Indianapolis Motor Speedway will be subject to search. This applies to all vehicles parking inside the track (oval). 16th Street will be closed Indy 500 Race Day between Olin Avenue on the east to the 16th Street roundabout on the west at approximately 11 a.m. In addition, to the 16th Street closure, Polco Street will not be accessible northbound from 10th Street during this time. From the North: Take 25th Street to Auburn Street. From the South: Take Crawfordsville Road to Winton Avenue. Infield Race Day Parking: Guests with a pre-paid infield parking pass or infield credentialed parking pass must enter through Gate 2 or Gate 10. Gate 2: Must enter westbound off 16th Street (use right two lanes to enter Gate 2) Guests with 5th & Hulman Parking passes are urged to arrive at IMS via 16th Street and Gate 2. Guests with Turn 3 and Turn 4 parking are urged to arrive at IMS via 30th Street and Gate 10. Gate 10: Enter off 30th Street. Guests with North 40 Parking passes must use 30th Street and Gate 10 to arrive at IMS. Must have pre-purchased parking pass to enter any IMS lot. 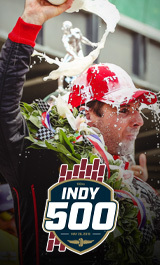 103rd Running of the Indianapolis 500 presented by Gainbridge rideshare information is coming soon. Grilling is allowed in the daily parking and tailgating areas on small portable grills. No dumping of charcoal or ashes is allowed. Portable shelters (i.e. E-Z Up shelters) no larger than 10 feet by 10 feet are allowed in designated daily parking and tailgating lots. They must be set up behind the vehicle, not taking another parking spot or hindering vehicle or pedestrian travel areas. Shelters must be secured to the vehicle. All shelters must be put away by the race starting time on Race Day in Lots 1B, 2 & 3 Grass. During practice week May 14 - May 20 parking is available in the infield. First come first served. Located on Georgetown Road, south of 30th street. Daily parking only, no overnight parking or camping is permitted. Located on 30th Street West of Georgetown Road. 30A and 50A Electric Upgrade Available. General parking spaces are available now. Limited free parking (First-Come, First-Serve) Excluding Race Day and Miller Lite Carb Day. No overnight parking or camping is permitted. No public motorhome or RV parking. No public motor home or RV parking.